It all started when my stock motor reached its 160 thousand mile mark. Noticing its soul and will to keep up with my heavy right foot had started to fail, I immediately looked into performing an engine conversion. 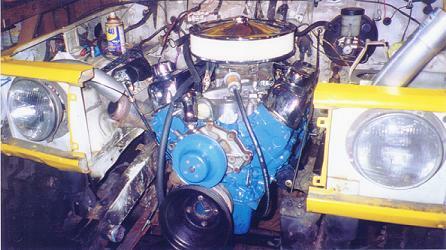 I had done a few other engine swaps in the past, and my first choice was to plant a 1.6Liter 16 valve (16v) in there. I decided the 16v was my prime choice to tackle the Florida swamps. I swapped in the 16v but still found myself wanting more power. My vehicle buildup was already evolving into a monster with 38.5" Super Swamper SX's. So I started looking elsewhere. Seeing as there were so many other various v6 swaps done by others, I ventured "out of the box" and looked forward to doing a swap that had not been done before, or extremely rare if nothing else. I had already performed a Chevy 307 v8 swap once before, so I was looking forward to using a Ford engine for the Zuk swap. I struck it lucky when a friend offered to give me a 302 absolutely free! I immediately jumped on the deal before the conversation was even finished. So I had my engine, and it came with a C4 automatic transmission. After noticing the extreme length of the C4, I looked into finding a smaller transmission for use in my swap. I came across a Ford F250 ZF transmission, their mass is mostly bulk as opposed to length, and I figured I'd give it a shot. After further research, I realized it come with a 5.71:1 first gear, and the optimum bonus being a five speed stick shift. I now had the two most important components for my drive train swap. 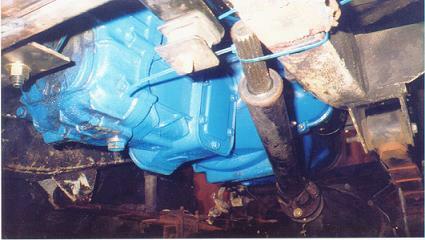 After breaking down the 302 block and cleaning it, all new seals were installed. It was also a good time to examine the block and replaced anything not easily accessible after re-assembly. A higher duration camshaft was installed along with rebuilt heads, and a new Holley carburetor finished things up. The ZF transmission showed signs of being in good condition, so it was mated with a freshly turned flywheel, brand new clutch disc and pressure plate. 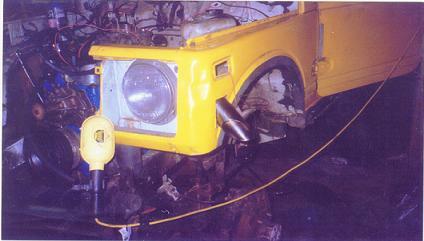 All that remained was the adaptation of the motor and transmission into the zuk body and frame. I had already performed a prior body lift, so I had that on my side. I immediately realized that the transmission tunnel would have to be modified to fit the ZF transmissions large size, but that was easily administered with a BFH (Big Hammer). The motor mounts would be an easy build, using older pickup style motor mounts and would only require building frame mounts that extended off the frame 3-3/8" (from frame to eyelet of hole). I quickly and easily built the mounts out of 3/16" sheet metal. Then came the cross member. I had to consider the front drive shaft, while keeping a sturdy set-up. By using 2" square-stock I found an easy setup. I was able to make a cross member by welding it across the bottom of the frame. 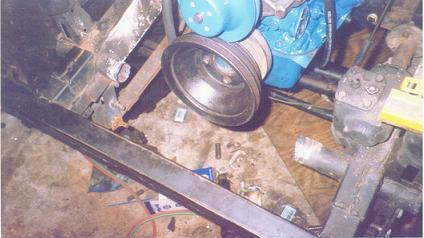 This kept the front drive shaft out of harms way, yet provided a strong mount for the transmission. Then the question of which transfer case should I use? I had heard through the grapevine of people using the stock Samurai transfer case in 1200 HP mud trucks due to their lightness and with their rare 1.409 high gear (as opposed to 1:1 in most other transfer cases). So I would give the stock Samurai transfer case a try. I made an intermediate drive shaft as short as I could that contained 2 U-joints. I did have to shorten the rear drive shaft about 3 inches, and extend the front about 4-5 inches. 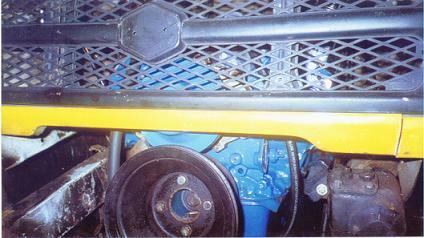 Another dilemma I came across was the limited space in the front of the engine compartment for a radiator. So how I was going to cool this motor? I had heard of people using rear mounted radiators in large engine swaps, so I immediately researched this rear mount concept. I ended up using a full-size radiator and high mounting it in the rear of the existing roll cage. I ran the fluid lines using metal fence post pipe and flex-hose. It turned out great. The two high CFM fans I used on the radiator kept things nice and cool. Now that the intake and coolant problems were figured out, the exhaust routing problem was next. I came across some Mac Shorty headers designed for a mustang for a song. Since I stumbled across this great find, I just had to make them work. With slight modifications they could easily fit between the frame rails. I had many thumbs up from friends with the idea of running them upside down with pipes coming out of the hood. After a lot of thought on that idea, I ended up welding 90 degree bends to the headers which dumped the exhaust out of the fenders through two 2.5" black chrome tips. I really liked this setup, with heavy revving it would spit out flames and surprisingly it wasnt too loud inside the cab. So everything was finished, we had some slight problems with the initial fire up, but every swap has bugs to be worked out. So how did it run? One word, Fast! The power was enormous and would easily swallow the 16v in its tracks. 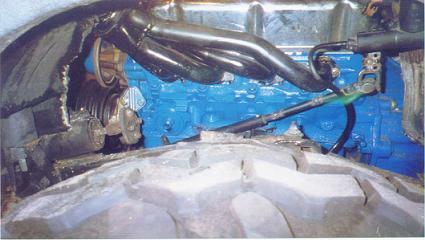 Im not dissing the 16v motor, because it is a lot to ask of a 4cyl powering 38.5" SX's through stock gearing. I just felt the need to push the limits, but I will admit the power outcome was far more then expected. Like lifting-the-driver-side-tire-off-the-ground-from-the-launch kind of power. Was this much power a necessity? Of course not. I did this so I would never have to worry about power loss with my buildup. So whats next? 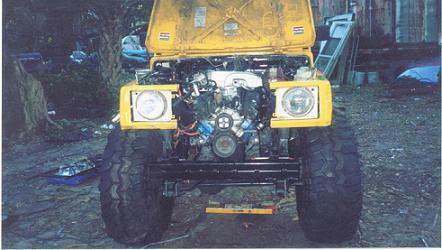 First things first I plan on mounting the Toyota axles I have under it in combination with a YJ suspension. After that its whatever idea fits me best. **Update** Well, my happiness always turns sour. My current 302 decided to spin its timing and rework (ah, damaged) its heads pretty good. So Big Bird was immediately back in the garage. 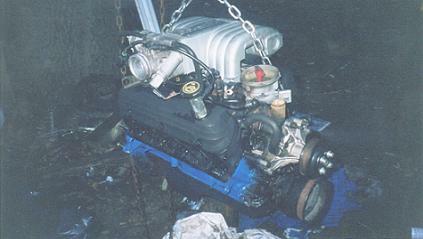 I came across a 1989 Ford Mustang HO motor for a very good deal and decided to buy it. I first decided against fuel injection as one of the reasons for doing the v8 swap in the first place was to try to keep engine diagnostics simple. Computer problems have an extensive history with me, so Im not a big fan of injection. I swapped over my carburetor setup from the old motor and it worked out fine. Next I focused on the radiator setup. I didnt like the rear mount system, and really would like to go to the original front mount setup. So I obtained a Ford Ranger radiator and easily fitted it between the front body clip and engine. It was something I was willing to try, and could easily be changed back if I wasnt satisfied. So Big Bird was back on the road with a little more pep in its step. I'm growing to hate a few details of the ZF transmission, but I will try and make it work. Thoughts of a different transmission setup are being tossed around right now. I will first try other new features to my current setup to try and help it out. END.